Santa Cruz Mountain Brewing, Santa Cruz, Calif. In converting a warehouse in an offbeat neighborhood to an organic microbrewery, the married duo of Emily Thomas and Chad Brill proved to be up for anything. So five years later, when the Southern California couple needed to rethink their decision to construct a bar out of green wood that hadn't yet properly cured, they were open to less-than-traditional construction materials. "My husband wanted to go with stainless steel," says Thomas of their plans for tearing down and reconstructing a bar that, while only five years old, was already buckling, warping and showing gaps. But one regular patron of Santa Cruz Mountain Brewing had another proposal, says Thomas. "Dominic told me, 'This bar will be so cool that people will come in just to see it.' And they do." The man with the plan was Dominic Boinich. A former construction superintendent, Boinich is a metal fabricator who designs and creates furniture and commissioned public art. At 5 Feet From the Moon Studios, in Santa Cruz, he and girlfriend Katrina King, a metal sculptor, work in metals, wood, glass and other media. Boinich had also recently expanded his palette to include decorative concrete as Counter Balance. "I can practically see it from my studio," he says, explaining his regular patronage and interest in the microbrewery and its hapless bar. Boinich got so excited about the prospects of replacing the 17-foot-long wooden top with GFRC concrete that he agreed to do it for, in his words, "a thousand bucks in beer and a couple thousand in materials." In precasting the three long segments at his studio in late October of last year, Boinich had to make a spur-of-the-moment decision to cover up a minor flaw. He settled upon a wood-grain stamp pattern along one end that harks back to the surface's all-wood origins. "It looks like the old bar is growing right back into the concrete," he says. The bar's surface also contains five disks that serve as glass holders. For each, Boinich hand-etched a Santa Cruz Mountain Brewing logo and provided illumination via pocket lights with dimmer control under each disk. Boinich is most proud of a sneaky touch he gave to the brass seams that define the bar's segments. One is a stylized letter S, while the other takes the curvy form of a C. "Most people don't even notice it until I point it out," says Boinich, "but the letters stand for Santa Cruz." Only one of his characteristic design flourishes gave him even a moment's pause. The wavy-edge technique used at one end is "a trade secret" which he won't divulge, but he says this about his inspiration: "I just had this vision in my mind, a cocktail table with a tablecloth hanging from it. I was just pushing the envelope to see how much I could stretch concrete. I had some concern that I might be going a bit over the top here, but the basic concrete color keeps it from going too far." From Emily Thomas' standpoint, maintenance is easy, and there's certainly no fears of splintering or warping this rugged surface. Best of all, it serves as an attraction in its own right. As she stated in a handwritten thank-you note to Boinich after the job was completed, "A customer's experience at the brewery is so crucial to the future of the company and you have just elevated that experience." As a regular, Boinich knows the reaction of others to what is possibly the area's first concrete bar. "They flip over it," he says. "The bartenders are getting tired of answering questions about it." 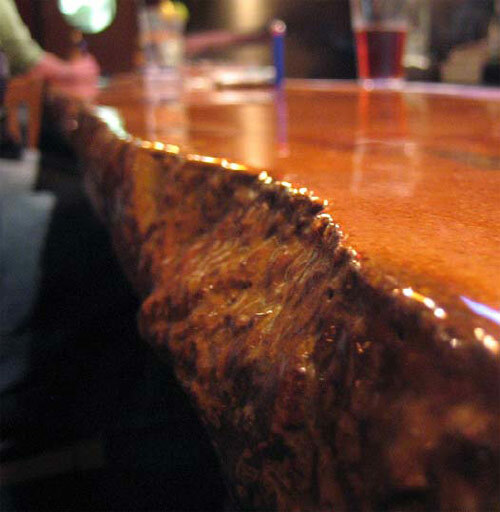 This 26-foot-long cast-in-place bar looked like a "Flintstone bar" at first, according to artisan Michael Crane. It came out with broken edges and a pale orange tone that wasn't quite right. He ground it, leaving color in recessed areas, and finished with a two-part epoxy. Coyote Cafe, Virginia Beach, Va. While Michael Crane can't say for certain that the ice bar he designed and poured at the Coyote Cafe in Virginia Beach, Va., is the only one of its kind in the world, he's willing to go pretty far out on that limb. "There's one in Florida and one in Switzerland, but they're both different than mine." Those and a few other places around the globe are frozen bars constructed entirely of ice. But if you want to talk about the combined artistry of decorative concrete and solid water - in the form of a 4-inch wide, 1.75-inch illuminated deep trench to keep drinks chilled - well, now you're most likely talking one-of-a-kind. As president of A Touch of Stone Custom Tile & Decorative Concrete in Hampton Roads, Va., Crane saw his mission at Coyote Cafe as being to "bring concrete and water together in one functioning unit." He was on his own when he did so. "I looked all over on the Internet but couldn't find any direction for the ice rail," he says. So he figured it out for himself. Working with an HVAC pro, he designed his own preplumbed drop-in kit that went into a 2-by-4 trough cast into the concrete and lined with copper flashing. "It's plumbed with a water supply line and an HVAC line, the ice kept at minus 5 degrees Fahrenheit," he says of the design, which he's considering patenting. "Then I added a string of indoor/outdoor rope lighting in the ice that gives it a glowing, cool blue appearance." But before his client's customers could chill, Crane had to contend with a 26-foot-long, cast-in-place concrete structure that, he says, "looked like a Flintstone bar at first." The eight-hour pour came out with broken edges and a pale orange tone that wasn't the one he had seen in his mind's eye. "I ground it down, leaving color in the recessed areas, and finished it with a two-part epoxy." 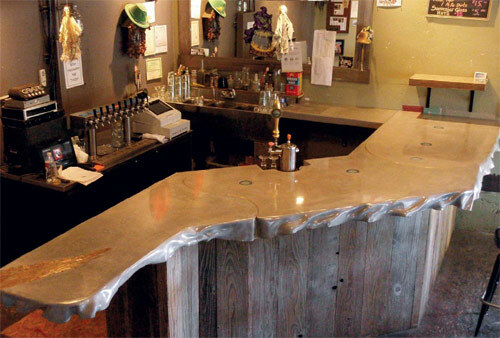 He also retained a wavy, broken edge design to the bar that adds intrigue and could even make the occasional patron wonder if he or she might have exceeded sensible self-imposed limits by a drink or two. The bar itself, along with the stained concrete floor under it, has a warm glow that goes well with the restaurant's Tex-Mex Fusion theme. In terms of maintenance, the ice bar threw the bartenders a little bit of a curve. "They'd have to iron it every day to get the ice to melt," says Crane. "Yeah. You know ... with a clothes iron." Oh, sure. The ironing became part of the daily opening ritual in order to vaporize the dirty surface of ice from the night before. There was also a matter of thawing and draining the trench every couple of months. As for maintaining the decorative concrete surface, "just scrub it with a hot rag," advises Crane. "Maybe rub in a little beeswax now and then." Innovative design and "ice age technology" are no guarantee of success. 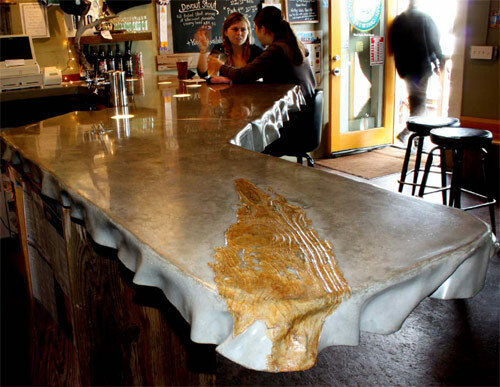 The Coyote Cafe earned favorable comments for the new bar from barstool perchers such as the consumer reviewer who wrote at TripAdvisor.com, "Loved the unique bar, with the strip of ice that keeps one's drink cool and drinkable!" Another wrote of the place, which he and his wife stumbled into virtually by accident: "The interior is dark and romantic and the bar is absolutely beautiful. It is equipped with an ice (rail) to keep your drinks cold." The ice bar wasn't enough. The Coyote Cafe closed recently in the tough economic environment. Proving, we suppose, that, despite the icy artistry of Michael Crane, it's still a cold, cold world out there. The process for “free-forming” a fabric mold — for all kinds of creative, ripply results — is a little different but will include many of the same steps as basic fabric forming. The biggest difference is that you will be working on the outside of the mold first. Pouring concrete into fabric instead of the usual rigid formwork represents, for some, the shape of things to come.